Romania has long held claim to the vampire tourism title, owing to Bram Stoker’s famous 1897 novel Dracula, set in the Romanian countryside of Transylvania. While a work of fiction, Dracula nonetheless had its roots in Romanian history and historical tales of vampires, and Transylvania has become culturally synonymous with vampirism. Bulgaria has always been a contender for that crown as well, however, and in 2012, a grisly discovery seriously boosted Bulgaria’s position in this grisly arena. Vampire tourism might sound creepy to some and kitschy to others, but it’s still significant tourism that pools serious money into the museums, hotels, and restaurants of Bulgaria. In the summer of 2012, in the Bulgarian Black Sea port town of Sozopol, two 700-year-old skeletons were unearthed. Nasty enough stuff, but what made them significant was that they each had iron rods thrust through their chests. This practice was performed on anyone considered to be a vampire or who had the potential to return to life as a vampire, and was still in use as late as the early 19th century. In fact, according to Bozhidar Dimitrov, head of the Bulgarian National History Museum, “Over 100 buried people whose corpses were stabbed to prevent them from becoming vampires have been discovered across Bulgaria over the years, ”although archaeologists stated that this was the first time a “vampire” burial has been discovered in Sozopol. The two skeletons found were simply men, with nothing to indicate actual vampirism, no doubt to the dismay of many. They were simply subjected to a pagan ritual to ensure they would not become one. People who were deemed to be evil, or even just evilly inclined, in life were pierced with massive rods to prevent full evil conversion after death. Couple this reality with vampiric folklore about stakes through the heart and international frenzy for vampire-based fiction and adventures, even the watered-down Twilight series, and you’ve got curious people willing to travel and spend their money to check out the vampires. Quick to capitalize on this discovery and attention, The Natural History Museum in Sofia displayed one of the skeletons almost immediately that summer, with an expectedly large turnout for the display. 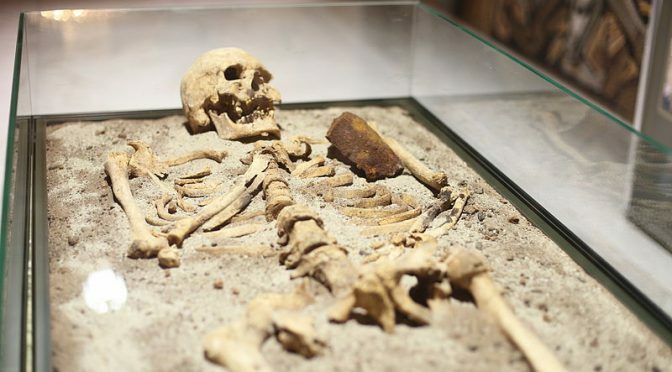 Legends of vampires remain prevalent in many of the Balkan countries, and there have been reports that some people in Sozopol, where the two skeletons were discovered, have been having trouble sleeping at night since the discovery. Mr. Dimitrov gave more specific information about the “Sozopol vampire” whose skeleton went on display, explaining that the vampire’s name was Krivich, (meaning The Crooked), and he was a legendary pirate, either manager of the Sozopol fortress or one of his heirs. The Crooked, as his contemporaries called him, had been a crippled, but extremely intelligent man. He outshined everyone with his knowledge about the sea, the stars and herbs. Byzantine chronicles describe how he plundered a Venetian ship. It is possible that he was declared a master of the witchcraft because of these talents, which explains the metal stake through his heart. The grave was discovered near the apse of a church, which suggests that he was an aristocrat, and not a vampire at all. Still, for anyone interested in the history and legends of vampires, it’s an intriguing discovery, and one that is a continuing boon for the Bulgarian tourism industry.